I am trying to understand the advantages of multiprocessing over threading. I know that multiprocessing gets around the Global Interpreter Lock, but what other advantages are there, and can threading not do the same thing? The threading module uses threads, the multiprocessing module uses processes. The difference is that threads run in the same memory space, while processes have separate memory. This makes it a bit harder to share objects between processes with multiprocessing. Since threads use the same memory, precautions have to be taken or two threads will write to the same memory at the same time. This is what the global interpreter lock is for. Here are some pros/cons I came up with. Threading's job is to enable applications to be responsive. Suppose you have a database connection and you need to respond to user input. Without threading, if the database connection is busy the application will not be able to respond to the user. By splitting off the database connection into a separate thread you can make the application more responsive. Also because both threads are in the same process, they can access the same data structures - good performance, plus a flexible software design. Note that due to the GIL the app isn't actually doing two things at once, but what we've done is put the resource lock on the database into a separate thread so that CPU time can be switched between it and the user interaction. CPU time gets rationed out between the threads. Multiprocessing is for times when you really do want more than one thing to be done at any given time. Suppose your application needs to connect to 6 databases and perform a complex matrix transformation on each dataset. Putting each job in a separate thread might help a little because when one connection is idle another one could get some CPU time, but the processing would not be done in parallel because the GIL means that you're only ever using the resources of one CPU. By putting each job in a Multiprocessing process, each can run on it's own CPU and run at full efficiency. The key advantage is isolation. A crashing process won't bring down other processes, whereas a crashing thread will probably wreak havoc with other threads. Another thing not mentioned is that it depends on what OS you are using where speed is concerned. In Windows processes are costly so threads would be better in windows but in unix processes are faster than their windows variants so using processes in unix is much safer plus quick to spawn. Other answers have focused more on the multithreading vs multiprocessing aspect, but in python Global Interpreter Lock (GIL) has to be taken into account. When more number (say k) of threads are created, generally they will not increase the performance by k times, as it will still be running as a single threaded application. GIL is a global lock which locks everything out and allows only single thread execution utilizing only a single core. The performance does increase in places where C extensions like numpy, Network, I/O are being used, where a lot of background work is done and GIL is released. So when threading is used, there is only a single operating system level thread while python creates pseudo-threads which are completely managed by threading itself but are essentially running as a single process. Preemption takes place between these pseudo threads. If the CPU runs at maximum capacity, you may want to switch to multiprocessing. Now in case of self-contained instances of execution, you can instead opt for pool. But in case of overlapping data, where you may want processes communicating you should use multiprocessing.Process. As mentioned in the question, Multiprocessing in Python is the only real way to achieve true parallelism. Multithreading cannot achieve this because the GIL prevents threads from running in parallel. As a consequence, threading may not always be useful in Python, and in fact, may even result in worse performance depending on what you are trying to achieve. For example, if you are performing a CPU-bound task such as decompressing gzip files or 3D-rendering (anything CPU intensive) then threading may actually hinder your performance rather than help. In such a case, you would want to use Multiprocessing as only this method actually runs in parallel and will help distribute the weight of the task at hand. There could be some overhead to this since Multiprocessing involves copying the memory of a script into each subprocess which may cause issues for larger-sized applications. However, Multithreading becomes useful when your task is IO-bound. For example, if most of your task involves waiting on API-calls, you would use Multithreading because why not start up another request in another thread while you wait, rather than have your CPU sit idly by. I've highlighted the key Python documentation quotes about Process vs Threads and the GIL at: What is the global interpreter lock (GIL) in CPython? I did a bit of benchmarking in order to show the difference more concretely. 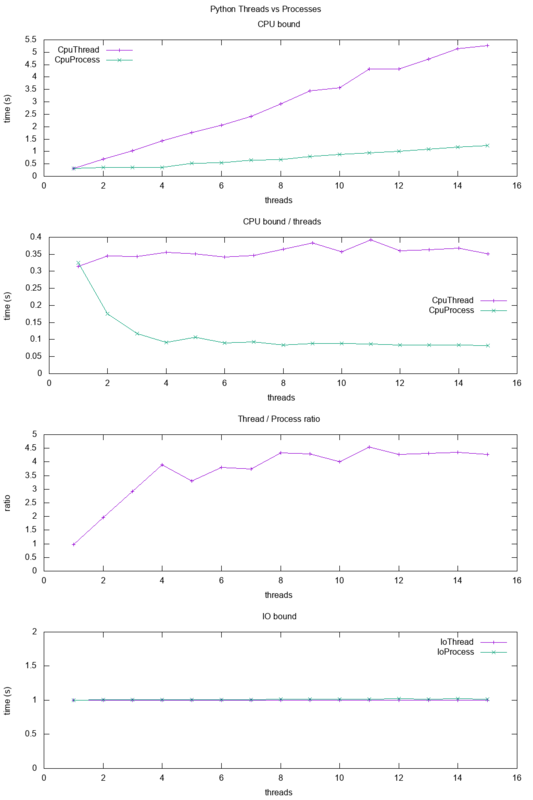 In the benchmark, I timed CPU and IO bound work for various numbers of threads on an 8 hyperthread CPU. The work supplied is the same for each number of threads (thus more threads means more total work supplied). threads only scale up to about 4x instead of the expected 8x since I'm on an 8 hyperthread machine. Contrast that with a C POSIX CPU-bound work which reaches the expected 8x speedup: What do 'real', 'user' and 'sys' mean in the output of time(1)? TODO: I don't know the reason for this, there must be other Python inefficiencies coming into play. A useless CPU bound function. GitHub upstream + plotting code on same directory. Tested on Ubuntu 18.10, Python 3.6.7, in a Lenovo ThinkPad P51 laptop with CPU: Intel Core i7-7820HQ CPU (4 cores / 8 threads), RAM: 2x Samsung M471A2K43BB1-CRC (2x 16GiB), SSD: Samsung MZVLB512HAJQ-000L7 (3,000 MB/s). Process may have multiple threads. These threads may share memory and are the units of execution within a process. Processes run on the CPU, so threads are residing under each process. Processes are individual entities which run independently. If you want to share data or state between each process, you may use a memory-storage tool such as Cache(redis, memcache), Files, or a Database. Multiprocessing adds CPUs to increase computing power. Multiple processes are executed concurrently. Creation of a process is time-consuming and resource intensive. Multiprocessing can be symmetric or asymmetric. The multiprocessing library in Python uses separate memory space, multiple CPU cores, bypasses GIL limitations in CPython, child processes are killable (ex. function calls in program) and is much easier to use. Some caveats of the module are a larger memory footprint and IPC’s a little more complicated with more overhead. Multithreading creates multiple threads of a single process to increase computing power. Multiple threads of a single process are executed concurrently. Creation of a thread is economical in both sense time and resource. The multithreading library is lightweight, shares memory, responsible for responsive UI and is used well for I/O bound applications. The module isn’t killable and is subject to the GIL. Multiple threads live in the same process in the same space, each thread will do a specific task, have its own code, own stack memory, instruction pointer, and share heap memory. If a thread has a memory leak it can damage the other threads and parent process. Python 3 has the facility of Launching parallel tasks. This makes our work easier. It has for thread pooling and Process pooling. Not the answer you're looking for? Browse other questions tagged python multithreading multiprocessing or ask your own question. What to use Multiprocessing or multi-threading in Python? What are the differences between the threading and multiprocessing modules?